If you are a gamer then graphics card is the most important component that you must have in your desktop PC. This is because onboard graphics processors are not powerful enough to run even the older generation games at playable frame rates on 1080p. You can do normal tasks and watch HD movies on onboard graphics but if you want more than that and want to run latest games or graphics intensive applications / programs then you should have at least a budget graphics card installed in your PC. Graphics card also increase the performance of your PC because it takes the load off from your Processor and RAM for performing graphics related work. Even a low-end graphics card can beat onboard graphics by a decent margin. 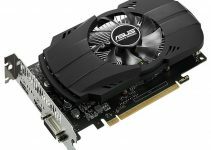 One of the most common reasons why people avoid buying graphics card is because graphics cards are not that cheap and they are happy with the onboard integrated graphics. A low end graphics card can cost anything between $50 – $100 but graphics cards under 200 dollars gives you best performance for your money. A mid range graphics card can cost you well above $200 dollars and higher ones can go to up to $500 and more. Having said that there are some budget graphics cards that falls in affordable price segment and they can be used for playing latest games at medium to high level settings at 1080p. You can run the mid-range and the older games at higher settings at 1080p using these budget graphics cards. So here in this post I am going to list down the best budget graphics cards from Nvidia and AMD with their specifications. You can buy these graphics cards to enjoy decent level of gaming on your PC. 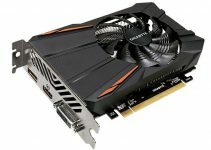 These affordable, cheap and budget graphics cards costs around 100 to 200 dollars and offers best value for your money. You can also look at the list of best graphics cards under 100 dollars budget if your budget is on the lower side. Here are the best budget video cards from Nvidia for gaming. Nvidia offers wide range of graphics cards starting from budget to high-end. GeForce GT 740 is one of the cheapest budget graphics cards that you get for gaming purpose. GeForce GT 740 is a low power graphics card from nvidia that offers very good value for money. It also runs very cool compared to the mid-range or high-end graphics cards available today. Here we have the EVGA GeForce GT 740 Graphics card which is a superclocked version and comes with 2GB GDDR5 memory. It is a DirectX 12 ready graphics card and is fairly powerful considering its price. You can play CSGO on it at maximum settings on 1080p. You can also play games like Fallout 3, Oblivion, Skyrim, etc. on HD with this budget graphics card. This card can beat the older high-end graphics card 9800GT with a huge margin. If you are building a budget gaming PC then this graphics card is a perfect choice. The length of the card is on the shorter side which makes it easier to fit in almost all types of ATX cabinets and mini-ITX cases. This PCI-E 3.0 graphics card has maximum power consumption of 64 Watts and you will only need a good 400 Watt PSU for it. There is a large heatsink and fan which keeps the card temperature well in check. The connectivity options include dual DVI and mHDMI. You may find this budget graphics card under $100. 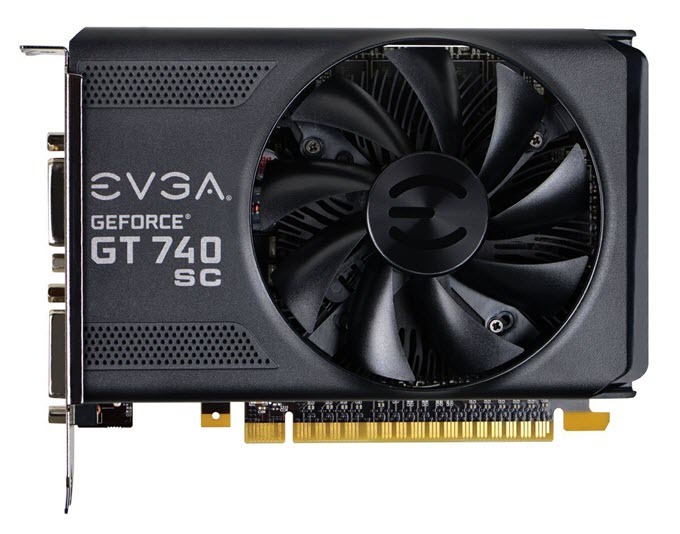 Here are the specifications of the EVGA GeForce GT 740 SC edition. Here we have the Nvidia GeForce GTX 750 Ti from MSI. 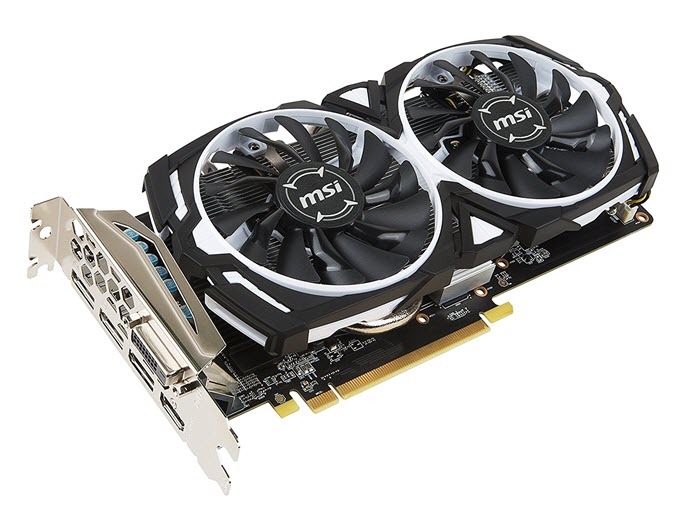 This is the TwinFrozr edition of the MSI GeForce GTX 750 Ti graphics card that comes with 2GB GDDR5 memory and dual fans for faster and effective cooling. GeForce GTX 750 Ti is the most popular budget graphics card in the mid-range graphics cards segment. It offers excellent value for your money and is powerful enough to play latest games on medium settings at 1080p. You can run older games on high settings on 1080p on GTX 750 Ti. GeForce GTX 750 Ti might be a litter older card because of the newly launched GTX 1050 but it still offers great performance in almost all the latest games. GeForce GTX 750 Ti comes with 640 CUDA Cores which is almost the double of that in GT 740. This Overclocked MSI TwinFrozr GeForce GTX 750 Ti runs very cool and has relatively lower power consumption compared to other GTX 750 Ti cards from brands such as Asus, EVGA etc. The other good thing about this graphics card is that even being a GTX 750 Ti it does not require external power which i think is amazing for a card of this size and power. The maximum power consumption of this DirectX 12 mid-range budget graphics card is around 60 Watt. This is a full length and full width graphics card and it does need more space inside your cabinet. You can run this graphics card even on an average 400W power supply. The exact model number of this graphics card is N750 Ti TF 2GD5/OC. 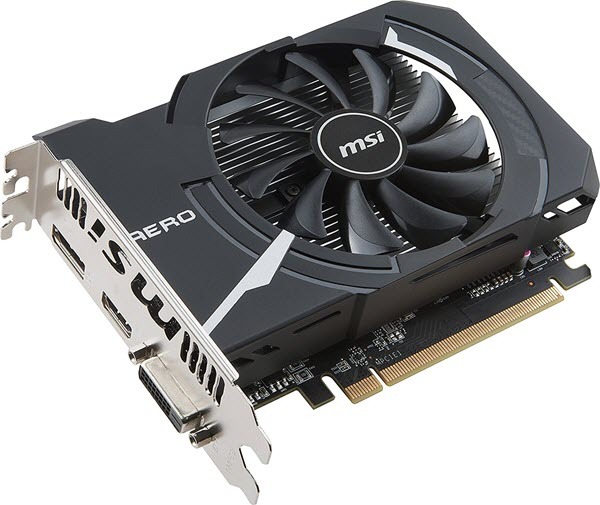 GeForce GTX 950 is the best mid-range budget graphics card in the GeForce 900 series from nvidia. GeForce GTX 950 can even beat the GTX 750 Ti in good number of gaming benchmarks. 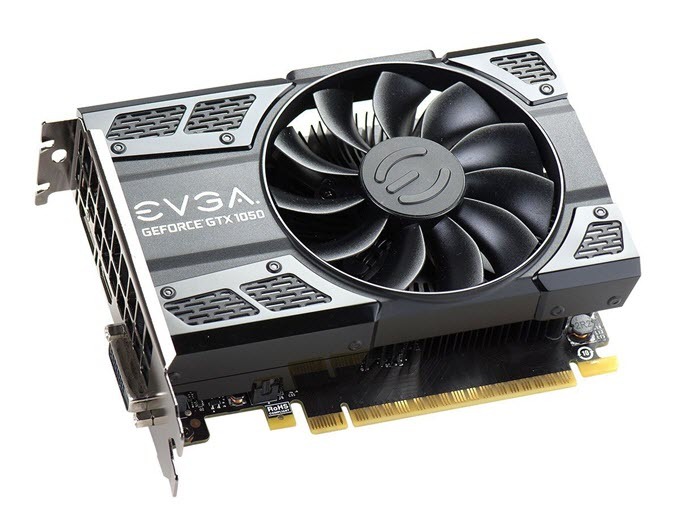 Here we have the Superclocked + Gaming version of GTX 950 from EVGA. It comes with 2GB GDDR5 memory having 128-bit interface. This card is based on the nvidia Maxwell architecture. This is a pretty powerful graphics card and you can easily run the latest games on medium-high settings at 1080p. You can run the older games at Ultra settings at 1440p on this graphics card. You can easily play games like CS:GO , Elite Dangerous, Skyrim, MGSV, and Killing Floor 2 at 1080p on high graphics settings. High-end games like Fallout 4 can be run on Ultra settings at 1080p with an average of around 50 – 60 fps. This is one of the best budget graphics cards that packs a lot of power for its price. 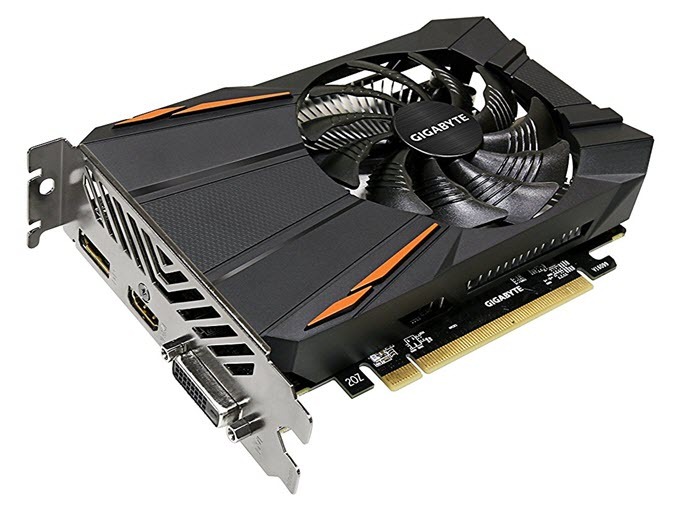 Gigabyte GeForce GT 1030 OC 2G comes with 384 CUDA Cores and 2GB GDDR5 Video Memory having 64-bit interface. It is based on the Pascal GPU architecture from Nvidia. This is an OC version which has higher clock speeds than the reference GeForce GT 1030. 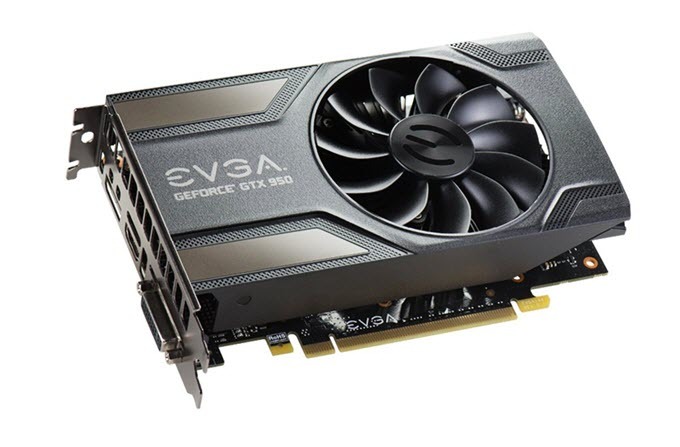 This is a great budget graphics card for eSports gaming, casual gaming and it can also run some of the latest games on low-medium graphics settings at 900p or even 1080p depending on the game. It is also a very good card for HTPC and 4K video playback. 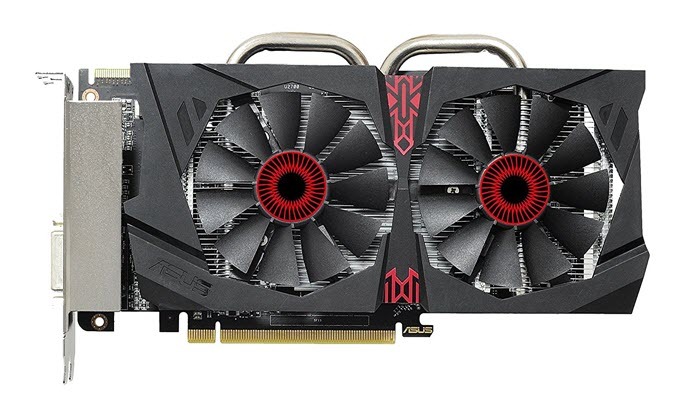 The main competitor of this card is Radeon RX 550 from AMD. The card comes with single 90mm fan for cooling and supports HDMI 4K@60Hz, Smooth 4K video playback and HTML5 web browsing and One-click overclocking via AORUS Graphics Engine. The card has lower power consumption and it does not require external power from the PSU. The recommend power supply for this card is 300W. Connectivity options include DVI-D and HDMI ports. 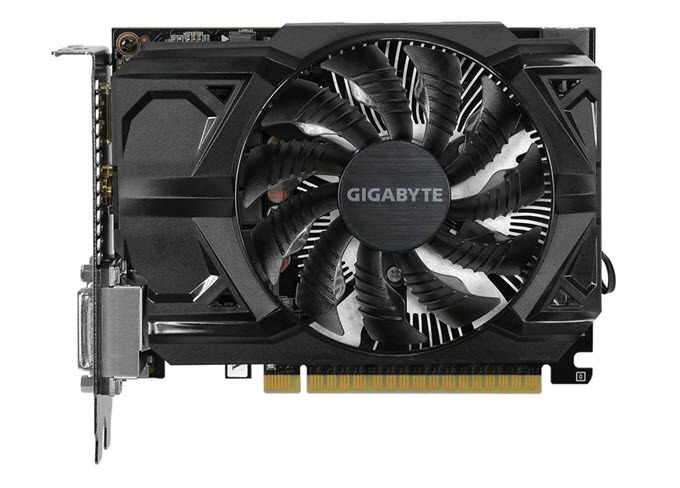 You may get this powerful budget graphics card under 100 dollars or so . It you want an affordable graphics card more powerful than GeForce GT 1030 then GeForce GT 1050 is the answer. GeForce GT 1050 is a budget mid-range graphics card based on the Pascal GPU architecture and comes with 640 CUDA Cores and 2GB GDDR5 memory having 128-bit bus width. Here we have ZOTAC GeForce GTC 1050 Mini which is a small form factor graphics card that can fit on almost all mini-ITX and SFF PC Cases. 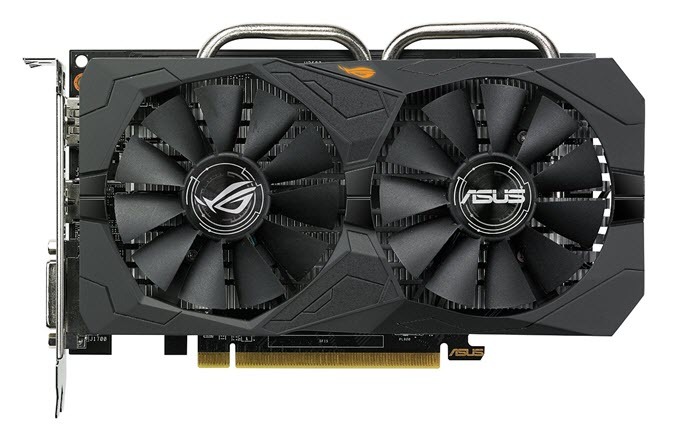 This is a fairly powerful graphics card and you can play games like GTA 5, Assassins Creed Unity, AC origins on medium-high settings at 1080p resolution. Also, this is a great card to have if you are into eSports gaming. The card run on stock GTX 1050 speeds and is cooled down by a single 90mm fan over an aluminum heatsink. 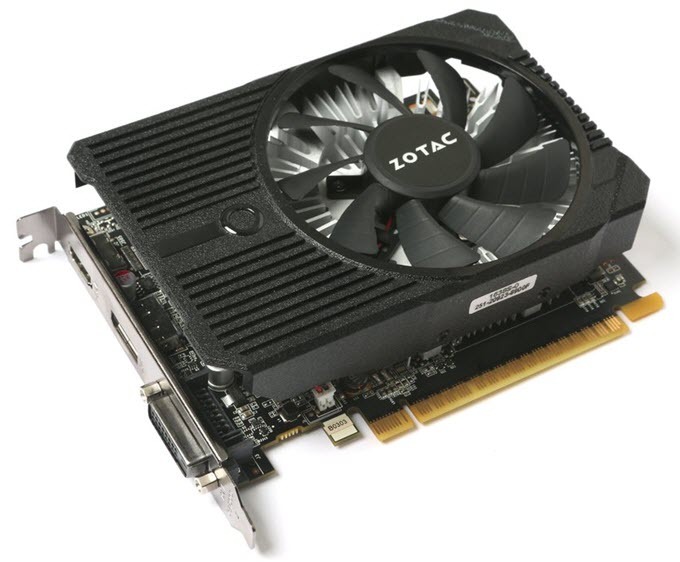 You may overclock this card using the Zotac Firestorm overclocking utility. This is again a low power graphics card having power consumption of 75W only and it does not require external power from the PSU and requires only a good 300W PSU for its working. Connectivity options include DVI, HDMI and DisplayPort. Here comes the latest mid-range budget graphics card which is the GeForce GTX 1050 Ti. This card is a real performer and beats GTX 750 Ti and GTX 950 easily in almost every possible gaming benchmarks. Here we have the Superclocked Gaming edition of GeForce GTX 1050 Ti from EVGA which is faster than a traditional GeForce GTX 1050 Ti from other brands. The size of this EVGA GTX 1050 Ti is compact which makes it easier to fit in majority of the computer cases including mini-ITX cases. GeForce GTX 1050 Ti comes with the latest Nvidia Pascal Architecture that offers excellent performance with improved efficiency and lower power consumption. You can play latest games at 1080 on medium-high settings with an average of 50 – 60 fps or more. This graphics card has a dual slot design and comes with a single fan. The card remains pretty cool considering the power it possess. It can run demanding titles such as Overwatch, Planet Coaster etc. on high settings at 1080p. You can use this graphics card even with a good 300W PSU which is astonishing. So if you are looking the best budget graphics card in the mid-range segment from nvidia then look no further. In mu opinion this is the best graphics card for a budget mid-range gaming PC. Here are the best budget graphics cards from AMD for gaming. AMD Radeon Graphics Cards offers excellent performance for the price and are used by many PC gamers worldwide. AMD Radeon R7 360 is one of the best gaming budget graphics cards you can find in AMD. The performance of R7 360 is comparable to that of GTX 750 Ti. Practically GeForce GTX 750 Ti is faster than the Radeon R7 360 but on the other side R7 360X is much cheaper than the GTX 750 Ti. This makes Radeon R7 360X a much better value for money card than the GTX 750 Ti. Basically Radeon R7 360 is just a reboot of the older Radeon R7 260 graphics card. Here we have the OC or Overclocked version of AMD Radeon R7 360 from Gigabyte. It comes with 2GB GDDR5 memory having 128-bit interface. The large 90mm fan on the top keeps the graphics card quite and cool even during gaming. The card is pretty compact in size which means smaller cabinets will not face any difficulty in accommodating it. Radeon R7 370 is really a powerful mid-range budget graphics card. It has better performance than the GTX 750 Ti but is slower than the GTX 1050. Here we have the Overclocked edition of Radeon R7 370 from Asus which is known as ASUS STRIX Radeon R7 370 OC. This card comes with 4GB GDDR5 VRAM and dual Fans to provide optimum cooling. The card is also very silent and Asus claims that it is around 30% cooler and 3 times quieter than the reference Radeon R7 370 card. You can play games like Fallout 4, GTA 5 on medium-high settings on 1080p. Gigabyte Radeon RX 550 D5 2G is an entry level budget graphics card based on the AMD Radeon RX 550 GPU. The card is based on the Polaris GPU architecture and comes with 512 Stream Processors and 2GB GDDR5 memory having interface of 128-bit. This is a great card for budget gaming, eSports gaming, HTPC, 4K display, 1080p Video editing and settings up multiple monitors setup. The main competitor of this card is GeForce GT 1030 from Nvidia. It is an OC version and you can overclock it easily using one click overclocking using AORUS Graphics Engine utility. 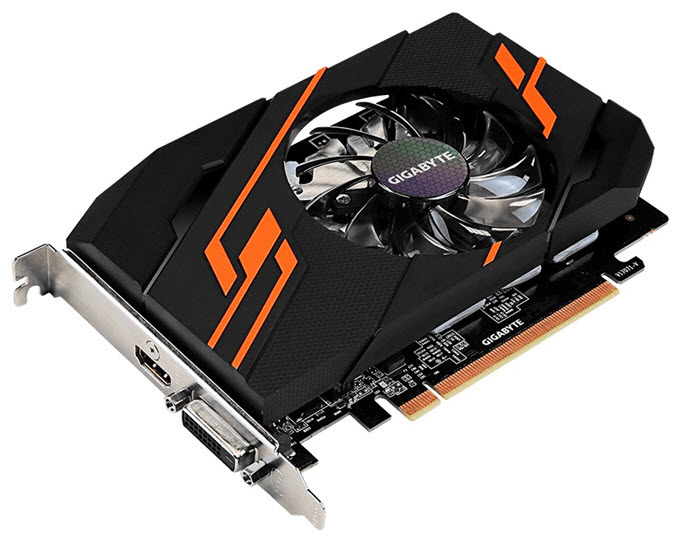 This Radeon RX 550 graphics card from Gigabyte comes with a single 90mm and aluminum heatsink for cooling. It consumes a bit more power than GT 1030 but still it does not require external power from the PSU and draws all its power from the PCI-E x16 slot. The card requires a 400W PSU for its working. Connectivity options include DVI, HDMI and DisplayPort. Radeon RX 460 is a newer series mid-range graphics card from AMD. It is built on the latest Polaris architecture from AMD that provides excellent performance with lower power consumption with silent operation. Radeon RX 460 is a bit faster than the older R7 370. 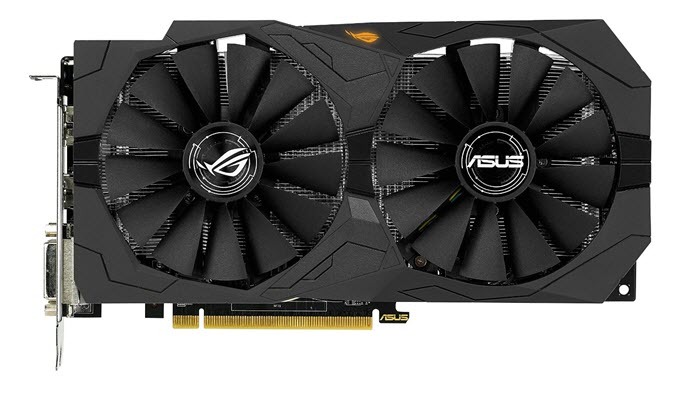 Here we have the ASUS ROG Strix RX 460 that comes with 4GB GDDR5 VRAM having 128-bit interface. The Radeon RX series also supports the Vulkan API. It is one of the best budget graphics cards as it offers excellent performance in its price range. The card runs very cool and you can play games like CS:GO, DOTA 2, Overwatch , Doom on 1080p at medium-high graphics settings. You may check out the link below for its current availability and price. Radeon RX 560 is a mid-range graphics card based on the Polaris GPU architecture. 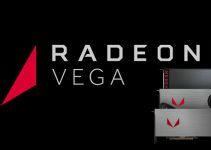 It is a refresh of AMD Radeon RX 460 and comes with slightly higher clock speeds and a bit higher performance. It comes with 1024 Stream Processors and 4GB Video Memory having 128-bit interface. On this graphics card you can play latest games on medium-high graphics settings at 1080p with around 50 – 60 FPS. The main competitor of this graphics card is GeForce GTX 1050 and GeForce GTX 1050 Ti from Nvidia. Here we have MSI Radeon RX 560 AERO ITX 4G OC which is an OC version of Radeon RX 560. You can overclock this card using the MSI Afterburner overclocking software. This is an SFF compact graphics card and can easily fit in mini-ITX cases. This is a dual slot graphics card and for cooling it comes with single fan and aluminum heatsink. The card consumes less power, does not requires external power connectors (6-pin / 8-pin) from the PSU, and requires a 400W Power Supply for its working. Display connectivity options include DVI, HDMI and DisplayPort. Radeon RX 470 is the most powerful mid-range budget graphics card that you can buy for your gaming PC. This card also beats GTX 1050 Ti in gaming benchmarks and performance. Here we have the Overclocked ASUS ROG STRIX Radeon RX 470 that comes with 4GB GDDR5 VRAM. This graphics card has dual fans and bigger heatsink which keeps it very cool and quiet. You can play the latest games on high graphics settings at 1080p on this graphics card. AMD Radeon RX 570 is unarguably the best budget graphics card for gaming. It is a powerful mid-range graphics card and is an upgrade over Radeon RX 470 graphics card. RX 570 comes with same number of stream processors found in RX 470 but has slightly greater performance than RX 470 because of higher GPU and Memory frequencies. Like Radeon RX 470, Radeon RX 570 is also based on the Polaris GPU architecture from AMD. 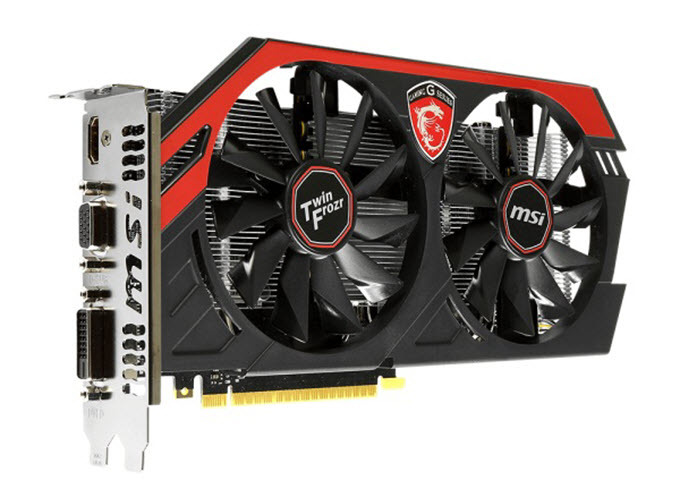 Here we got MSI Radeon RX 570 ARMOR 4G OC that comes with 4GB GDDR5 memory and dual fans for cooling. The graphics card comes pre-overclocked which means you will get higher performance over the reference Radeon RX 570. You may also overclock the card further using MSI Afterburner overclocking software for extra performance. For cooling the card comes with ARMOR 2X design equipped with two TORX fans. The card also comes with Zero Frozr technology which stops the fans when in low load conditions and thus makes the card super silent. On this card you can play latest game on very high / ultra settings at 1080p resolution with good frame rates. Various features of this card include Crossfire Multi-GPU support, AMD FreeSync, HDR compatible. The card requires an 8-pin PCI-Express power connector and a good 450W PSU for its working. At the end I would like to say that I have listed down the best budget graphics cards for gaming at 1080p. If you have any queries on which graphics card to get for yourself then you can ask me your query by leaving a comment below clearly stating your requirements and budget for that graphics card. Hello….I’m looking for a graphics card for a build. Mainly to play planet coaster and wow. I’ll half the ryzen 5 2600x and msi gaming pro carbon ac motherboard with plenty of memory. But i dont what card and not break my wallet.